Recent development of matrix-assisted laser desorption/ionization-imaging mass spectrometry (MALDI-IMS) is summarized. 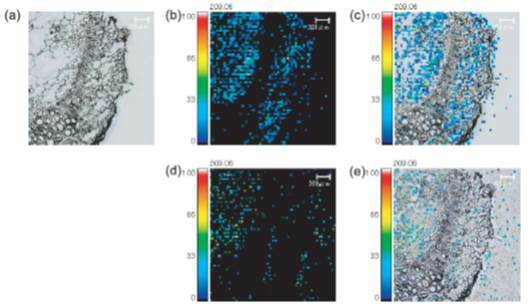 Comparing about ten years ago when study of imaging mass spectrometry was started, sample preparation methodology is dramatically improved as well as instruments performance. Our group performs MALDI-IMS under microscope using iMScope TRIO (Shimadzu, Kyoto, Japan). In microscopic MALDI-IMS, special sample preparations are required to improve detection sensitivity and spacial definition. We consider “one-size-fits-all” sample preparation method cannot be available to date, therefore sample preparation methods should be selected for different sample types or target molecules.